The museum, inaugurated in 1987 and progressively enlarged over the years, is housed on the upper floor of the great arcade erected by Gherardo Silvani (1634) very near to the façade of the legendary sanctuary, which was embellished and enriched over the centuries due to the fervid devotion to the image of the Virgin with Child which is still housed in there today. Re-painted in 1758 by Ignazio Hugford, it is an ancient icon which, considered the protector of Florence, was transferred into the city during the gravest moments in its history, with great participation of the people: at the time, the Medici grand dukes and the most noble Tuscan families engaged in a competition to make the most generous donations in order to demonstrate gratitude to the Madonna. The competition was such as to create, over the centuries, the extraordinary artistic heritage to which the museum has been specifically dedicated. The objects displayed belong to three principal categories: the jeweler’s art, fabrics and illuminated codices, all of them of extraordinary quality. To the first section, truly imposing, is dedicated the principal room named after the already mentioned Gherardo Silvani, in which silver and rock crystal stand out with their sumptuous reflections. 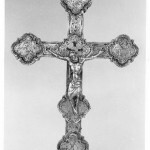 In addition to the splendid series of votive vases, one can admire an Astylar cross attributed to Lorenzo Ghiberti (1425 ca) and a Reliquary of the Holy Cross (1620) attributed to the famous jeweler Cosimo Merlini who may have executed it on commission for Maria Magdalena of Austria, the wife of Cosimo II de’ Medici. The Reliquary of Saint Sextus (1614) by Simone Pignoni is also precious because it evokes a great masterpiece of sculpture, reproducing in silver the refined forms of the sarcophagus made by Verrocchio for the Old Sacristy of San Lorenzo in Florence. The transfer of the Virgin’s icon in 1633, like the one of 1711, gave way to the very rich series of gifts exhibited in this room, to which must be added an altar frontal donated by Cosimo III de’ Medici and executed by Cosimo Merlini on the design of Giovan Battista Foggini (exhibited inside the basilica on the altar of the Virgin). Going on to the sacred paraments, we should remember the six little capes from the 16th-18th centuries that protected the image of the Madonna, but also the very refined chasubles and the embroidered altar cloth in gauze of the 16th century are worth a careful look. The visitor should not miss the small valuable cushion which was part of the sepulchral furnishing of bishop Antonio degli Agli (before 1477) whose rich sarcophagus is inside the basilica: an ancient and rare example of patch-work which uses pieces of salvage precious fabrics. 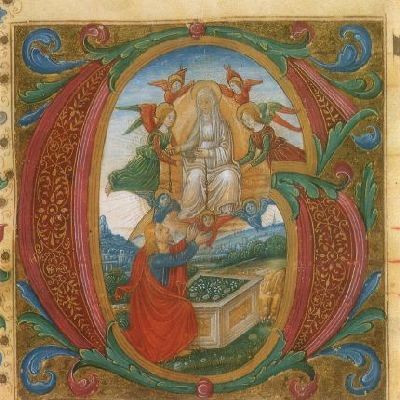 The section dedicated to the illuminated codices is just as rich, even being a part of the original collection of the basilica, is to be pointed out for their number and quality: in fact, there are eleven manuscripts from the 1300’s and the 1500’s. 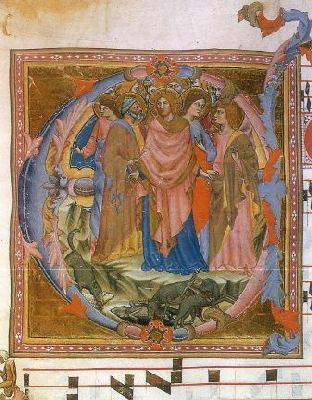 In the first group, we also find a Gradual attributed to Lippo di Benivieni (1310-20 ca), in addition to some illuminated antiphonaries by artists linked to Pacino di Buonaguida. 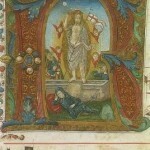 In the group of the 16th century codices are also found two Graduals by Antonio di Girolamo di Ugolino. Apart from the three important groups of objects pointed out, other works which are exhibited in the museum must be mentioned: first of all the very fine bas-relief of the 15th century Florentine School which constituted the ancient altar frontal of the Madonna and which represents the discovery of the Sacred image of the Virgin of Impruneta; then the tabernacle which was used to transfer the Madonna during the processions, a work from the half of the 14th century; a beautiful polyptych attributed to the Master of the Bargello (1360-65 ca), and finally a series of votive plaques and terracotta tiles which are a good example of Impruneta’s manufacture. Also in this case, the visit to the museum cannot be separated from one to the basilica, because between the two structures there is a connection that cannot be disregarded from both an ideal and historic-artistic point of view. Il Tesoro di Santa Maria dell’Impruneta. Paolucci A., Pacciani B., Proto Pisani R.C., Firenze, Editore: Becocci Editore, pagine: vol: I-II, 1987. It contains the antiphonies starting from an unspecific Feria II ad nocturno (in the Christmas liturgical cycle) until the Octave of Epiphany, followed by the services of Saints Andrew the Apostle, Lucy, and Thomas the Apostle. 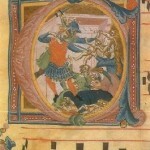 Codex VI. 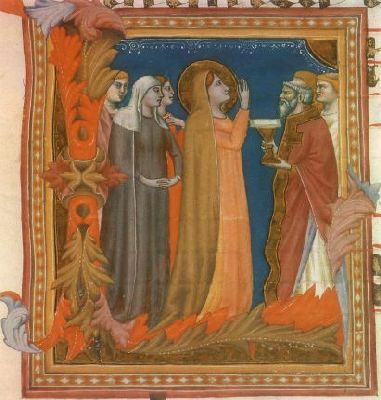 The Codex contains the antiphony to the Magnificat of the Saturday after the Pentecost. Size: 47.5 cm. x 30 cm. 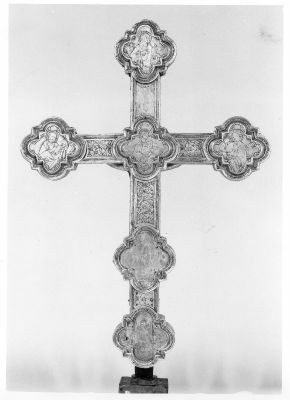 Recto of the cross. In the panels one can see God the Father at the top, the Virgin and Saint John at the sides, and Saint Zanobius at the bottom. 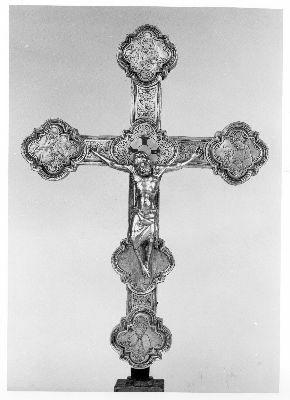 It may originally have been crafted for Santa Maria del Fiore and later passed to Impruneta where a silver cross appears in the inventories since the beginning of the 16th century. 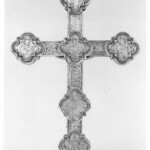 Size: cross: 47.5 cm. x 30 cm. ; Christ: 15 cm. 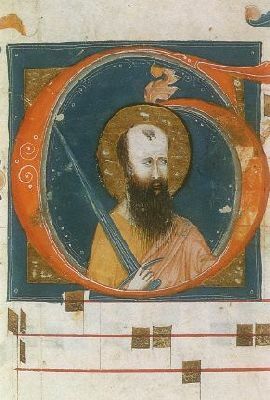 x 13.4 cm. Florence. It may have originally been crafted for Santa Maria del Fiore and later passed to Impruneta where a silver cross appears in the inventories from the beginning of the 16th century. 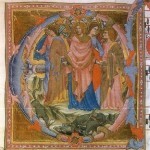 Day and night antiphonary from the first Saturday after the Octave of Epiphany until the sixth Sunday after Epiphany. Size: 540 mm. x 390 mm. 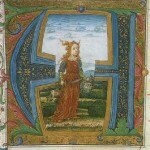 Codex VII. 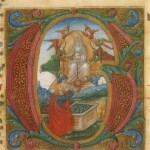 The codex is, among those attributable to Pacino di Bonaguida’s workshop, the richest but also the least homogeneous because of the various illuminators’ contributions of their own and distinct characteristics and with a great diversity of knowledge regarding the more current models. 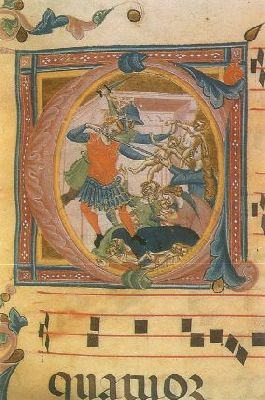 Here, the detail shows the Massacre of the Innocents. 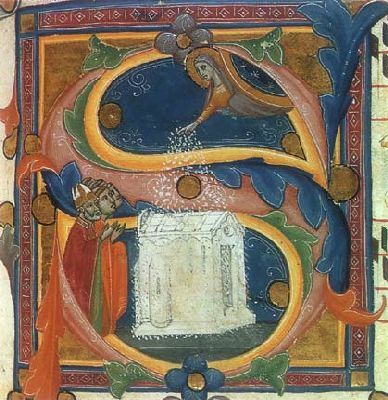 Technique and Materials: parchment codex Size: 530 mm. x 370 mm. Artist: Antonio di Girolamo di Ugolino, Florence1479-1556. 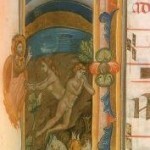 Gradual containing the parts of the mass from the Introito to the Antiphona ad communionem. 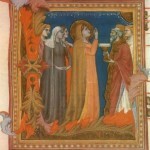 The scene depicted is of the Virgin giving her girdle to Saint Thomas (c.322). Gradual from the Holy Saturday of Easter. 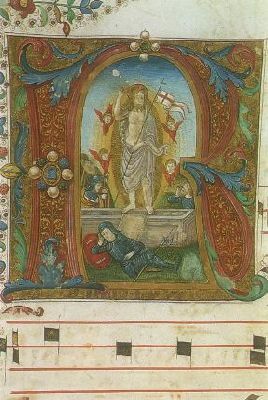 In the codex are the antiphonies to be sung during the various parts of the mass for the Easter holidays. A sober and elegant tone characterizes this artist’s work who expressed himself freely in the decorations with a repertoire that recalls the one used by his contemporaries in wood marquetry or ornamental bas-reliefs. 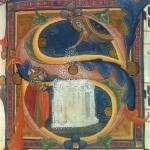 Technique and Materials: parchment codex Size: 530 mm. x 320 mm. There are the antiphonies of the Sundays and weekdays from the first Saturday of September until the Advent. 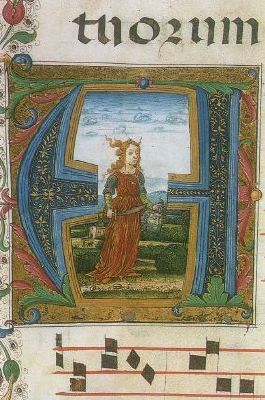 Many of the illuminations are evidently inspired by illustrious examples of 15th century painting: on leaf 24 verso, the scene with Judith clearly recalls Botticelli. Size: height 27.5 cm. x l. maximum width 16 cm. ; foot: diameter 10.5 cm. 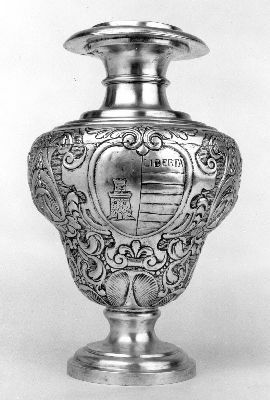 A unique and rich series of votive vessels are part of the treasury of the Church of Impruneta, these fifteen vessels were donated on the occasion of the famous 1633 procession as a sign of gratitude to the Virgin for having eradicated the plague. On the three tablets are the Madonna with Child, Saint Dominic, and the coat of arms seen here, with a turreted castle and the word libertà (the Spigliati Magalotti family?). Size: 99 cm. x 43 cm. 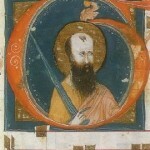 According to tradition, it was Filippo Scolari (Pippo Spano), count of Timisoara and Ozora and member of a branch of the Buondelmonti family who donated two important splinters of the Cross to the Basilica. The following inscription is engraved on the frame of the foot: Maria Magdalena Arcidux Austriae M.D. Etruriae in honorem salutiferae Crucis A.D. MDCXX. By car: from Florence, follow the signs to Galluzzo/San Felice a Ema. Continue along Via di Pozzolatico (towards Impruneta). Coming from the motorway A1, exit at Firenze Certosa and follow the signs to Galluzzo/San Felice a Ema. Continue along Via di Pozzolatico (towards Impruneta). By bus: SITA and COPIT bus service from Florence (Piazza Adua). Saturdays and Sundays, 10 a.m.-12:30 p.m. and 3:30 p.m.-6 p.m.